More than 5,500 college, high school and club swimmers from nearly 100 different teams jumped into the pool on Thursday, Nov. 6 at 5:00 PM with the same goal in mind –– going all out for an hour in the name of cancer research. 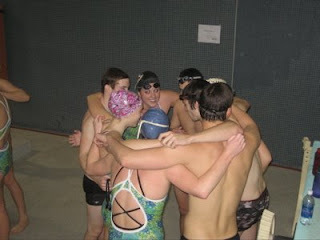 The Carleton College swimming and diving teams are sponsors of the third annual “Hour of Power” Relay for cancer research in honor of former Carleton student and teammate Ted Mullin, who passed away from sarcoma, a rare soft-tissue cancer, in September 2006 at the age of 22. 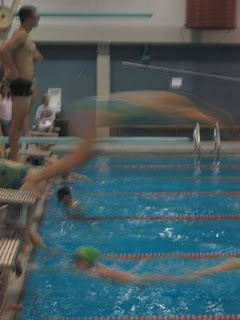 This year's "Hour of Power" included over eighty colleges swimming simultaneously. 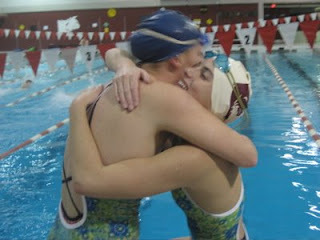 The event is a one-hour, all-out, leave-it-in-the-pool practice that involved teams from NCAA Division I, II and III. It was both an honor and privilege to swim and represent another human being - especially with over 5,500 other swimmers across the nation. The Bates Bobcats had a blast jamming to music, sprinting all out, and cheering each other on. Check out the pictures below!